I received this book for review this does not affect my opinion on this book, all opinions are my own. When I first got this book I wasn't very interested in it. I hadn't heard much about it, and the cover looked a bit creepy but when my friend saw I had this book she got so excited. That made me wonder what the book was about and I became more interested in reading it. I then picked it up and was unable to put it down. When I turned that last page I thought what a cliff hanger? I want the next book now! 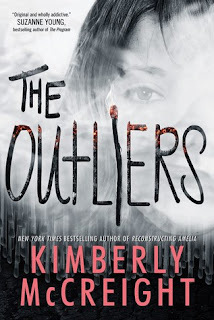 Kimberly manages to create a very unpredictable book. Just when you think you get what is going on in the book there is a plot twist! Again and again she caught me off guard. Wylie: Wylie is the main character, a 16 year old who refuses to leave her home partly due to her mom's passing. Wylie is prone to being nervous and she is unable to control it. She has a therapist Dr. Shepard whom she can no longer go see because she is unable to make herself leave the house. To make matters worst her once best friend Cassie no longer comes to visit her. They had a falling out and now she is lonelier than ever. Wylie misses her mom and although her father tries to make up for their loss he just isn't enough. The fact is that Wylie's mom loved unconditionally but she was also tough as nails when she needed to be. Wylie's dad is just "a hard-core nerd scientist who lives entirely in his head" and is unable to recreate her mother's affection. Jasper: Jasper is Cassie's boyfriend. He shows up to Wylie's house because he gets a cryptic message from Cassie saying "Go to Wylie's house". He is worried for her and although he doesn't know Wylie very well and Wylie isn't very fond of him he goes. Once at Wylie's house Cassie says more messages indicating that she needs Wylie's help and that Jasper will be willing to drive her. Jasper does this even though it means he can't go back home to grab anything he might need, he will be leaving with just the clothes on his back. Cassie: Although she is a essential character in this book we don't actually meet her in till later on in the book. What we know about her is from what she tells Wylie and Jasper via the text messages. The messages let us know that she messed up and is in trouble but not to call the police. Each message that she sends seems to get more frantic than the last. At one point she seems so desperate that she doesn't care if they call the police she just wants to be found. Jasper and Wylie set of not knowing where they are going Cassie only tells them vague directions like head north on x highway not a specific point where to go. They do as their told but Jasper's car starts to malfunction. Jasper is furious that his car gave out on him so early on in the rescue mission. Wylie glances around the gas station and sees if anyone might be willing to offer them help. She sees a woman with an infant and wonders if she would be willing to help. Wylie approaches her and asks to her surprise she says yes although the woman's husband seems to need more convincing than she did. Finally they set off on the road once again. Wylie and Jasper slightly cramped in the car but headed the right way nonetheless. As they stop at a place to eat things get out of hand. One thing leads to another and Wylie and Jasper end up running for their lives. This makes matters much more difficult in finding Cassie. Things seem to rapidly get worst before they get any better. You think you may be walking into a nice easy read but wind up with something entirely unexpected. This GIF shows how I felt when I started reading it and how I felt when I finished it. This book was so intriguing just seeing what Jasper and Wylie do to get to Cassie. Once they find her the twists and turns this book takes. I highly recommend this book it is very enjoyable. The characters aren't always what they seem and just as you think you figured it out you will be blown away.